I have been on a sewing binge today. Three bags, a summer skirt and this organizer. 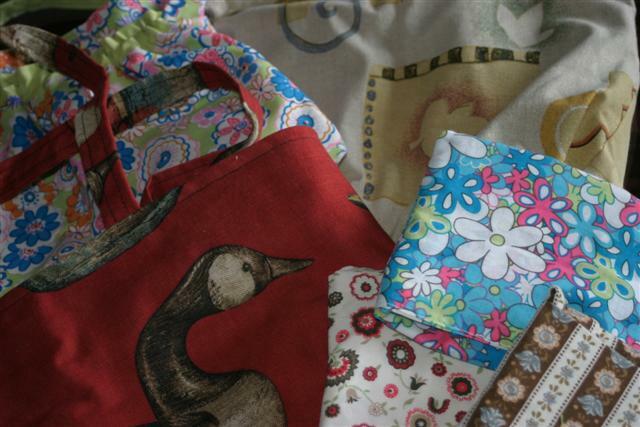 It was a great way to use some of my stash of brown vintage fabrics. The back is made from old kitchen curtains, the pockets are from vintage pillowcases. I love how they look combined. As soon as I hanged it, I stuffed it with all the things that were looking messy on the coatrack and it’s kind of full already. Still need to declutter! I started this morning by putting these parts of my furnace in the water to clean them, thinking I would go to my assignment for the newspaper, then take them out and clean the rest of the kitchen. But the assignment took me way longer than I assumed, I had to call the taxoffice, which took me an hour and all I learned from that was that I had to write a letter to explain why I think they refunded too little. I wrote the letter, found out we had no envelopes and no stamps around the house, drove to the postoffice, ran some other errants, remembered I wanted to buy something special for DH’s birthday, couldn’t find that in the first nor in the second shoppingcenter I checked, landed myself in a traffic jam, got home, started my cleaning again. Than the phone rang. DD M lost the keys to her bike. Could I come and pick her up? Well, I can’t let her walk 10 kilometers. So I drove to the school, got into an other trafficjam, needed some fuel, bought M an icecream and was home around five. My work for the newspaper has been slow for some weeks, but now it’s back. I have appointments for Wednesday, Thursday and Saturday and I have to plan a big interview in somewhere this week or the beginning of next week. And next week will be busy since DH is having his birthday on tuesday. But today I got an email from my publisher that I needed to submit a picture of myself for my book and their coming list of publications. So I gave dh my camera and he started taking pictures. I really really don’t like my pictures being taken. I look so old on them (don’t we all keep an image of ourself in our early twenties in our minds? ), my laugh is funny and my eyes… And there is the fact that I’m still a bit suffering from the flu. I can really see the redness of my nose, and the extra deep eyes. But dh says this is how I look. Oh well. This is not the one we sent to the publisher, but I think I like this one best. This is just me, grinning because dh is making me nervous waving that cameralens at me. May be I’ll send this one too, even though I think the background is too dark to be printed. So anyway, there you have it. Just me. This is me, being ill. Not a real picture of me, I’ll spare you the details of my watering eyes, puffy face and red nose. This was the third of the three big projects I started last year (the others: here and here). It didn’t turn out not as big as I intended, though (again: the logcabin is also a bit smaller than I would have liked). It thought it would be great to use as a bedspread for our own bed, but it’s not even half that size. And I’m almost completely out off yarn. It could be a cribsize or a lapsize. I’ll go for the latter, because there are no babies in my immediate future. I know I could try to find more of that yarn, but I’m so glad I’ve used it all. 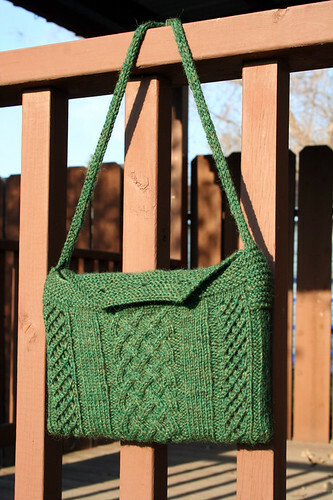 I bought it when I first picked up knitting again, thinking I would make a nice sweater for myself. But it was too cheap: it’s not spun evenly so the knitting looked lumpy. 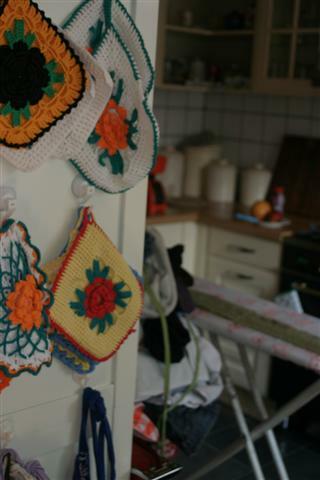 When I started crocheting it looked like a good and cheap start to learn making grannysquares. And a good way to use it all up. Ninetynine squares later, I think I mastered them… I did the joining on the right sight intentionally, thinking it would create a nice texture. It did, I had my doubts when I was about halfway through, but I like it now. Next on the crocheting list: the ripple blanket. Yes I know, another blanket. But this one will be a good kingsize, I swear! ... it's raining. Oh well. I keep thinking about a nursery rhyme about May Rain and growing. That's my wish: to keep growing (not my body of course, you know what I mean). We're ready for a long hot summer! 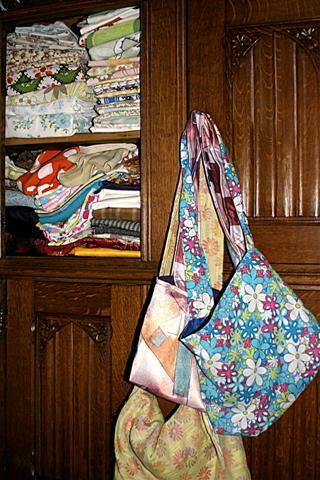 I like the blue flowery tote best, although I think it needs a button. Six more to go. Cutting out so many in front is not a good idea, I have learned that now. I like the process of creating something special during the whole cutting-sewing-changing_plans-cutting-sewing-thing and I miss that now. But I don’t want to waste those fabrics. I included my “good stash” in the picture to keep me interested. First I want to finish the old fabrics (stuff I bought last year, but don’t really like anymore) than cut into the vintage lovelies I found over these last few months. I want to try some thing more adventurous than these basic tote shapes too and I want to make a quilt of some of the pillowcases (most of them are too worn out to make into bags). Oh and there are still those dresses I want to make. It was a good day. The weather was great, the cakes tasted wonderful. That was a happy (17th!) birthday. Tomorrow the twins are having their birthday. So all three of them (youngest didn't want to be left out) made a cake. But lately I just can’t seem to get to some good sewingtime. And when I do I have to finish a dress (oh, forgot to show it all finished, will do that soon) or I have to sew curtains for our boat (still not been at the marine to hang them though), finish a bedspread (handsewing binding, blah!) or make covers for our couch (3 birthdays coming up, need to hide the burnmarks and spots on DH’s “office-space”). Also I wanted to use up some of the fabrics that have been in my cupboard too long. I got rid of some of the really ugly ones (I know, I promised not to, but I’m glad I did), but there is still a bunch that is not that inspiring to me anymore. I did cut eleven bags a few weeks ago and planned to sew them all in the week DH was on a bussiness trip, but that dress got in the way. And some headaches. I only finished two of them. I planned to use some of my vintage fabrics too, but I’m so uninspired lately that I hesitate to cut into them. Anyway. I have a purse, two totes and three fold-away marketbags. That’s not the big shop update I was looking for. I wanted it to be good and interesting so people would actually buy things.